Daniel Bor is neuroscientist in Cambridge England studying "chunking", the process of finding patterns in our perceptions and thoughts and creating a chunk that we can reference in the future. Chunking internalizes novelty, to make the pattern no longer novel. So, it is no surprise that this book's novel contribution to my understanding of consciousness is chunking. As with all of my book notes, this is not meant to be a summary, just the things I find most interesting and will want to reference in the future. This book is comprehensive, painting a full picture of consciousness from Bor's point of view. 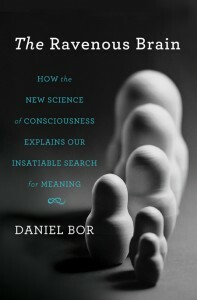 It is a must read, even if it is your third book on consciousness in six months. The big ideas in the book are chunking, working memory, information, awareness and attention, coalitions and the Global Workspace. It also has a good summary of 3 leading theories of consciousness, good section of on Free Will, a strong plug for meditation and many peanuts for the Elephant and Rider. consciousness is concerned with information - specifically, useful, structured information. Chunking is the main catalyst within the bubbling cauldron of our working memory where we convert the raw dust of data into molten gold, where basic information from our senses joins the highly refined hierarchical edifice of meaning that we've been building up from birth.
. . . Human innovation . . is happening almost all the time in all of us, whenever we are awake. Searching for and then finding useful strategies for solving problems, whether large or small, is a signature feature of consciousness. Perhaps what most distinguishes us humans from the rest of the animal kingdom is our ravenous desire to find structure in the information we pick up in the world. We cannot help actively searching for patterns - any hook in the data that will aid our performance and understanding. We constantly look for regularities . . . The main thesis of this book is that consciousness is simply a certain kind of processing of information, especially information that is useful, that captures some pattern to the world. This chapter will provide the context to this argument: Consciousness did not pop mysteriously out of the biological ether. Instead it evolved, like almost everything else in nature, in an incremental way, and is intimately linked to the universal blind biological enterprise of accurately capturing useful ideas. Consequently, almost all features of evolutionary "learning" are mirrored in the computational details of the brain, and of the landscape of our conscious minds. p.60 - a little wander into group selection? And beyond! And although talking about evolution beyond the realm of the organism is controversial, wherever there are competing ideas between information carriers capable of change, something resembling evolution in all but name may well occur. It's possible that some particularly complex ideas can really only be supported by a group of organisms, and that if an idea helps keep them all alive, then, again, evolution could, in principle, step in to favor this information chunk. . . So in this way, from the level of short sections of DNA all the way up to ecosystems and beyond, evolutionary pressures could in principle weed out those ideas incongruent with survival, while favoring any concepts that capture something accurate and crucial about the world. And one part of this process may well be the encouragement of the complex combination of ideas at the lower level to form more enlightened blind concepts a level above. p.65 - "If you view evolution essentially as the competition between ideas, with the best ones eventually claiming victory, then animals are in a sense clamping on an additional, internalized version of evolution in order to enhance their chances for survival."
. . . what matters, above all - is that in this blind struggle for survival and reproduction, in this delicate dance between genes and the environment, there is a pressure to gather information. All organisms are biological computers, forging a successful niche in the world by iteratively gathering a specific back of useful, implicit knowledge. All successful life, via the ideas stored in its DNA, shapes itself to the relevant features of the world. But animals, additionally can learn more dynamically. They can gather vital new facts to help them survive and adapt, not just between generations, but within their own lifetimes. At birth, we humans . . .
p.135 - "Four compartments to our awareness and no more . . ."
This tiny, yet ever so powerful output store of attention is our "working memory." Working memory is an inherently conscious short-term memory container where we can remember, rearrange, and evaluate whatever is in this group of items, even if it comes from different senses or categories. * The cause of this surprising limitation is a matter of intense current debate. One explanation suggests that three or four items are plenty, . . .
Another explanation, supported by computational models of how neurons interact, suggests that somewhere between three and four items is actually the maximum that can be practically sustained within a brain. Once attention has increased the signal for a given item, any neurons throughout the cortex that relate to any features of the object not only fire more actively, but also link together in a signature rhythm. If more than one object is being attended to simultaneously, multiple brain rhythms are required in order to keep the signals separate. But the brain can only sustain about three or four of these harmonies any more and they begin to blend into each other too much, and the result becomes a disjunctive neural noise, where objects become confused with each other or simply forgotten. So, we are four-channel reality processor. A quadriga? A two wheeled chariot pulled by 4 horses. Quadrophic - 4 channel sound. Quadrophenia, an album by the Who. Tetrahedron?
. . . there is a continuum of consciousness from humans to the smallest, simplest of creatures, but that within this there are distinct meaningful steps that emerge out of a deeper sense of awareness. These steps include self-awarenessss, a sense of doubt, and the ability to build pyramids of meaning within our own minds. In fact, a common drawback . . focus on neurological details while somewhat neglecting the psychological components that make up consciousness. In my view, the next iteration of these models will need to place attention as a key ingredient in the recipe for consciousness, rather than assume it is a separate process . . . Attention addresses a basic data-processing issue that almost all types of computers face. Simple information processing systems, such as plants or bacteria, are receiving only a faint trickle of information from their senses and have only a rudimentary ability to process that information. On the whole, all the information they receive, they process as far as they can. But for more complex systems, where the information stream flowing in is over-whelming the system's ability to process every item fully, there needs to be some decision process about which subset of all this mountain of data is most deserving of further analysis, and which other subsets are best ignored. This data filtering and boosting mechanism is attention. At the extreme end of this continuum of information input and analysis capabilities sits the human brain, with enormous cortical regions capable of very deep analysis. Hence the necessity for highly aggressive attentional filtering and boosting. This filtering can be so intense and focused, for instance, that we can foolishly walk for 30 minutes and hardly notice our surroundings at all. There is good experimental evidence to back up my impression that this controlled, directed attention is capable of actually enhancing both information processing and one's awareness of certain features of the world. This is trivially true when attention causes me to move my eyes toward some object of interest, thus allowing the central part of my visual field, the fovea, to focus on the item. The fovea has a particularly dense collection of photo-receptors and considerably more acute resolution than my peripheral vision. So the simple act of moving my eyes and focusing on an object allows a far higher, richer stream of visual information to be absorbed than if I wasn't looking directly at the object. Of course, once an animal has oriented toward an object, it tends to stare at it, soaking up the greater stream of input so that it can analyze more carefully what the object is, and thus further boost its processing of the information it is collecting for that object. The semi-chaotic activity of our 85 billion neurons undergoes a kind of temporary natural selection every moment of our waking lives, as attention shapes the contents of consciousness. Rival coalitions of neurons compete with one another to be heard the loudest. Those with the most powerful voice recruit others to their cause, and suppress any dissenters, until the strongest thought is carried by millions of neurons, all with one voice — for instance, to look for the black hair of your lover as she approaches down the street. Every time you have a new thought, that idea has become the dominant clan of your internal world, following a violent battle between jostling, screaming tribes. p.134 [jch: dominant coalition] attention . . . "consciousness might emerge from the winner-takes-all neuronal battles that occur unconsciously. Attention put information processing right at the heart of consciousness and suggests that consciousness is the end product of an aggressive data-filtering and boosting process." p.146 "Attention is certainly a necessary gating component of our consciousness, . . ."
Jonathan Haidt describes the Elephant & Rider metaphor in the Happiness Hypothesis. The elephant is all of the machinations of emotions and neuropeptides and unconscious and subconscious processes. Everything that happens before word gets to the rider is done by the elephant - fear, physical and emotional calculus. p.110 - "When I'm driving on the motorway, or even in the busy city, it doesn't take much for me to be engrossed in replaying a memory or following a train of thought, while my perception of the road, of moving the steering shell, the pedals, and so on, all disappear from consciousness." p.126 - internal/external driver of attention. "Out of many fighting voices in our minds, conscious control is but one choice, commonly pitted against a set of various bullying unconscious desires, where only a single voice can win out, to ruthlessly recruit to cause all conceptually related neurons though out the cortex and suppress any dissenters. p. 131 - "We are all in some ways appalling at making decisions, because our more primitive drives heavily bias us to think and act in short-term ways, so that we can survive and reproduce now, today, regardless of the next month, year, or decade."
. . . We should feel incredibly fortunate that evolution has endowed each of us with this immense biological computer, which can experience and control the world with such variety and depth. But our pride in the mental richness of our lives and the power of our intellect should be tempered by a nagging sense that, in the case of human brains, evolution almost seems to have overreached. The signature skill of our conscious minds, our advanced powers to search for profound patterns that help , us understand or conquer our environs, was only ever meant to serve our primitive evolutionary drives of survival and reproduction. This observation is most apparent in the vertiginous chasm that exists between the enormous wealth of conscious comprehension that any educated adult demonstrates daily and our embarrassing ignorance of the reasoning behind so many of our decisions. Some of us strive for a more enlightened life, somewhat divorced from these basic impulses, but such undercurrent motivations nevertheless rule and constrict us. Only in humans do these forceful evolutionary drives seem sometimes to clash so violently with higher conscious goals. p.184 "Francis Crick was the main early champion . . EEG .. when neurons act in harmony in a certain way, then consciousness ensues. .. love-in between neurons . . gamma band . . 40 cycles per second . . perhaps gamma is not fast enough for consciousness - instead, what is called "high gamma," with frequencies from 50 cycles per second, possibly even up to 250 cycles per second, is currently a hot topic in consciousness research." p. 85 - "The frontal lobe, especially the mid outer part, known as the lateral prefrontal cortex, is thought most centrally to be involved in conscious processes, probably in concert with the posterior parietal cortex, which sheres many of its functions." p.106 - Free Will: . . . Libet experiment . . refutes free will . . (maybe) . . But leaving this debate aside, I see the issue of free will rather simply. If the question is whether we have the freedom to choose, independent of the machinery of our brains as it interacts with the world, then of course we don't have free will. We are that machine, so how could we be independent of it? If one believes that no machine could ever have free will, then we don't either, and that's the end of the debate. Our conscious minds are uniquely capable of analyzing the consequences of our choices, even though, by default, many decisions may be made with little conscious input. The trick, somehow, is to wrestle control, as much as possible, into the realms of consciousness. One strategy may simply be to use our conscious minds more often: Our lives could improve considerably if we tried to ensure that any remotely important choice was given the full force of conscious, rational deliberation. By trusting the sophisticated conscious space we have, we can bring to bear the most refined, capable computational aspect of our brains, understand our own goals, avoid inherent biases, and make far more enlightened decisions. p.107 - "As it is, there is little we can to to shake the embedded illusion of free will, so we may as well play along. Part of the game we play is to define free will more softly in terms of decisions that are consciously, rationally made under normal circumstances."
. . . in whatever way we are looking at the world, with any sense or stimuli, we only ever are fully aware of about four objects. Any impression that we are aware of more items may simply be an illusion. This illusion is partly a product of our extreme readiness to group items together to take up a single working memory slot—for instance, the collection of all the visible stars that we are currently viewing. Without grouping together or fully processing any items in very busy surroundings, we usually only have a vague, faint conscious impression of its details. For instance, occasionally we may catch only the briefest glimpse of a scene and just have a gist of the objects in it. Our sense of gist reflects the fact that attention has two clear stages: The first, meager, less interesting stage of attention, and indeed awareness, is where we get a weak sense of everything around us, as if we're not really attending to anything—or rather, we are attending to everything in the same minimal way. This lasts for about 200 milliseconds. A short time later, though, the second form of attention kicks in, which is goal driven. Our neuronal landscape shapes itself according to the task at hand, and we start to hone in on interesting details—there's my wife in the station, say. During this second stage, our brains then calculate exactly what it is we want to focus on, what the few objects are that really matter. This important subset of our world gets a generous attentional boost, and we are far more aware of what matters. Everything else gets suppressed, and our awareness of whatever is outside our working memory and focus of attention may be-come invisible. p. 152 - genes FOXP2 . . . "language allows yet another level of information processing in nature, where chunks of insight can be passed between people and collaboration between members in a group can generate innovative new ideas, which would not have been possible alone." p. 261 - meditation - 20 minutes per day - try to be aware of as little as possible . . . increases activity in the lateral prefrontal cortex . . . shifts battle between amygdala and prefrontal cortex in PFC's favor. . . increases thickness of the prefrontal cortex. Maria Popova at Brain Pickings.